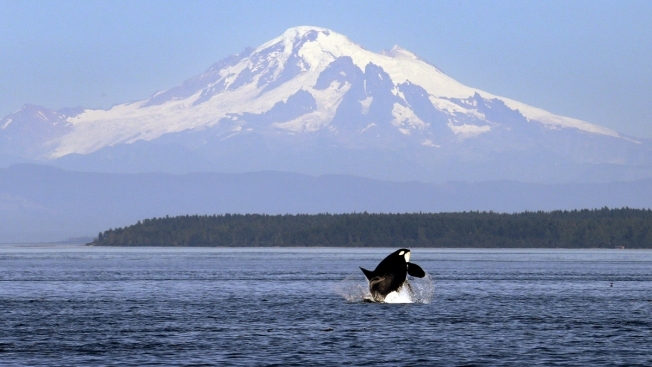 In this July 31, 2015, file photo, an orca whale breaches in view of Mount Baker in the Salish Sea in the San Juan Islands, Wash. The deaths of two young orcas in the Pacific Northwest have galvanized Washington state to do more to protect the whales' dwindling population, NBC News reported. First, a mother orca known as J35 carried her stillborn calf for 17 days. Then a rambunctious young killer whale known for breaching went missing and was soon declared dead. The orcas that spend their summers near Seattle have been listed as endangered as their population has fallen from near 200 to 74 due to falling salmon counts, pollution in the water and intrusions from whale watchers. "This is not a time for compromise and for moving slowly," said state Sen. Kevin Ranker. "This is a time for bold actions."